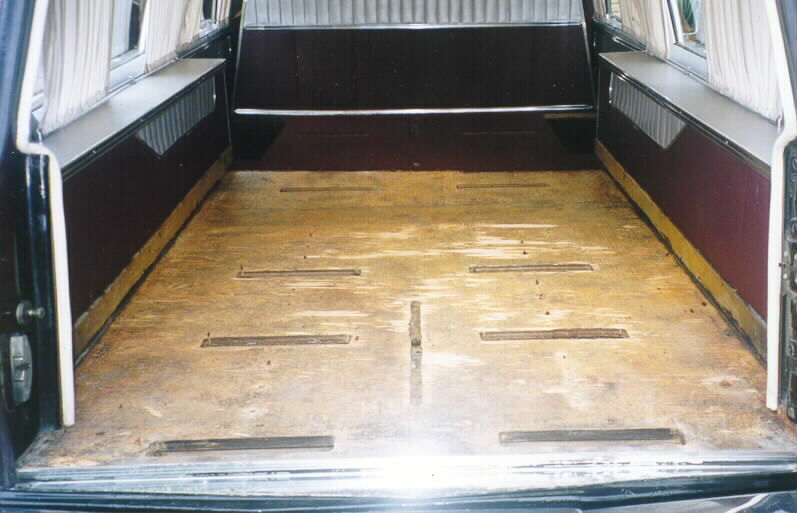 First of all the carpet was peeled back and the rollers, etc were removed. 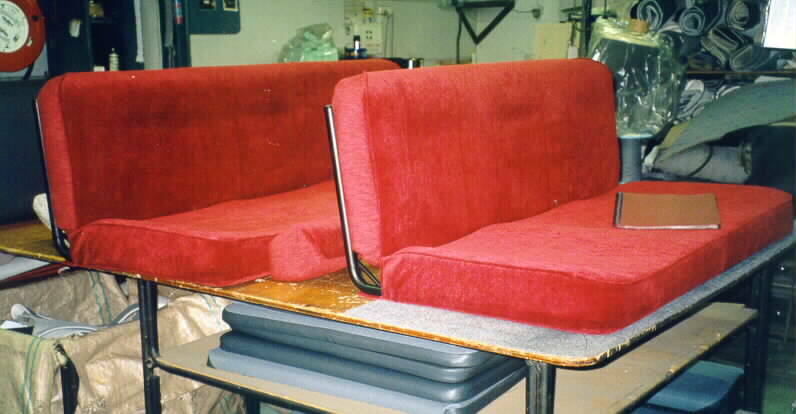 These were donated to Stuart to use on his 1936 La Salle hearse that is nearing completion. 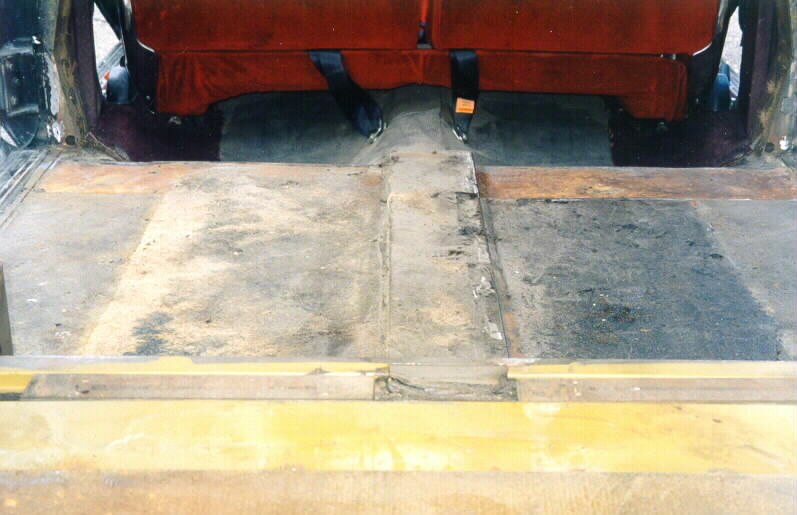 The forward-most sections of timber flooring (a false floor) were unscrewed to reveal the steel framework below. 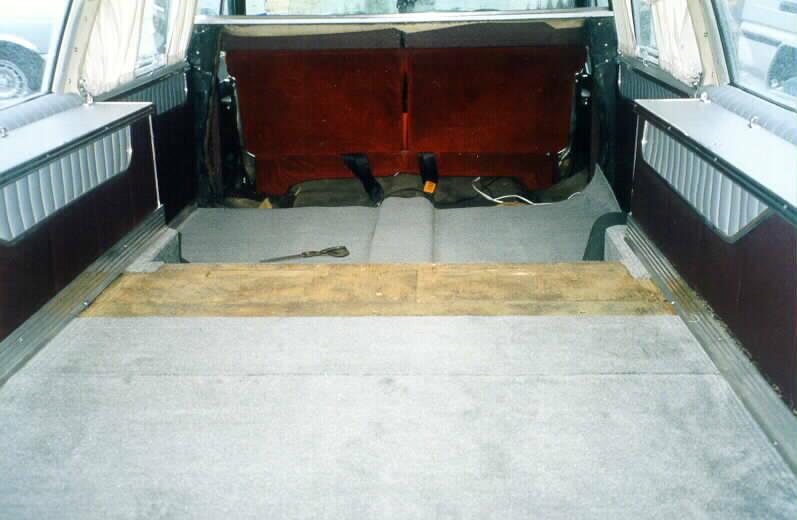 This part of the floor (forward of the diff) will be the footwell for the passengers. Here Kevin spent about 6 hours with the angle grinder (on a very hot day) removing more steel than in a new Hyundai (well almost!). 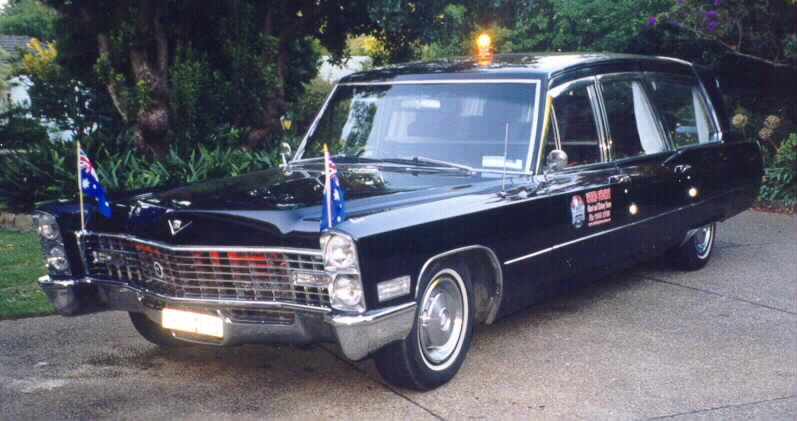 This hearse was really well built, and a credit to the craftsmen who built her! I half expected Elvira to start repairing herself and some 50's music to start playing by itself like in the movie "Christine" but nothing unusual like that happened, although as you can see the picture did turn out a bit "ghostly". 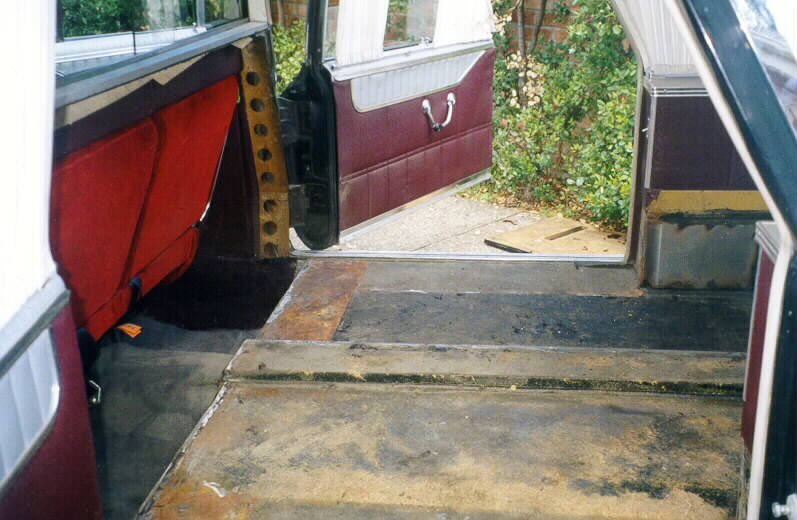 Note we also removed the box section behind the front seat where the spare wheel goes. This shot taken through the rear door. The view through the side door after all the "chop chop" was finished. All 5 doors were set up with remote controlled central locking and inter-faced with the latest high tech alarm system. This was a very difficult and time consuming job. 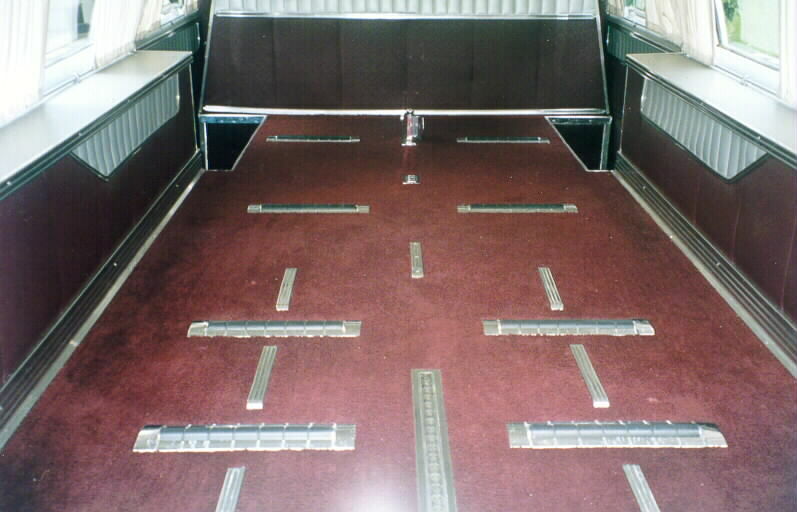 Prior to this, the door pillars had to have switches installed so the rear courtesy lights would operate from the doors. These rear lights can now also be controlled from a switch under the dash. An extra courtesy light has also been added overhead in the front cabin. The overhead cupboard had to come out too, to allow adequate headroom, but this is where the rear air conditioning evaporator unit will be installed. 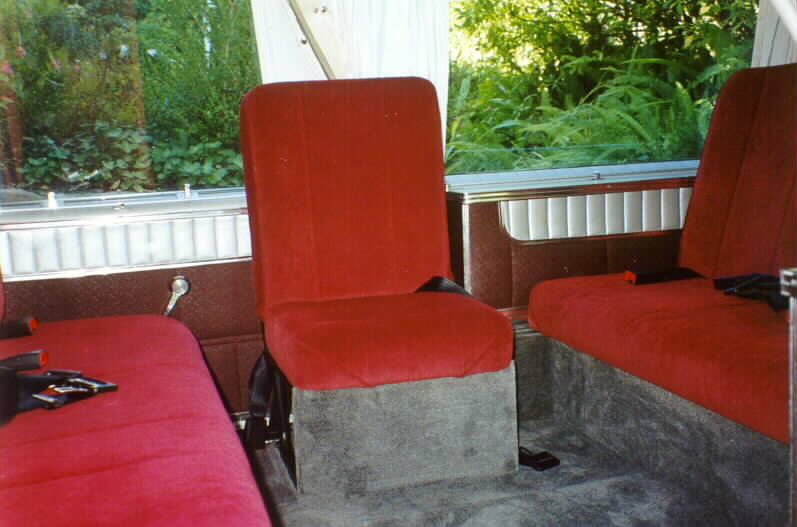 Meantime conversion to R134A has been succesfully completed for the front cabin area. 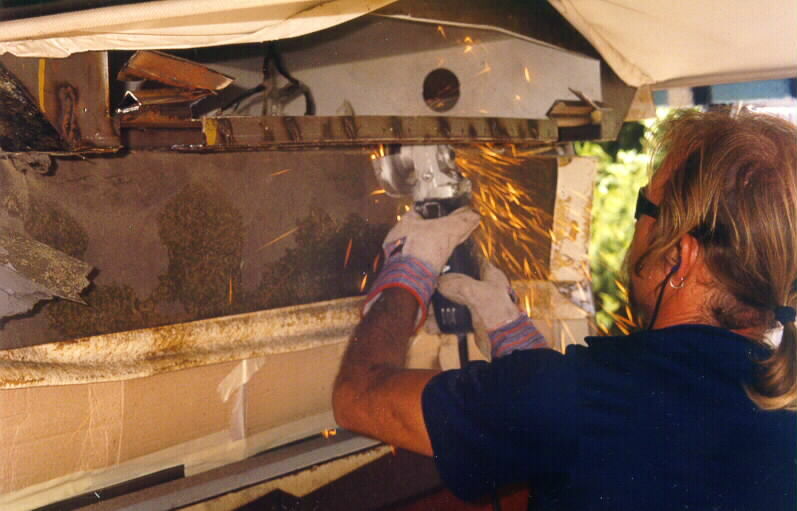 Note the dividing windows are covered to protect the glass from the metal sparks from the angle grinder. 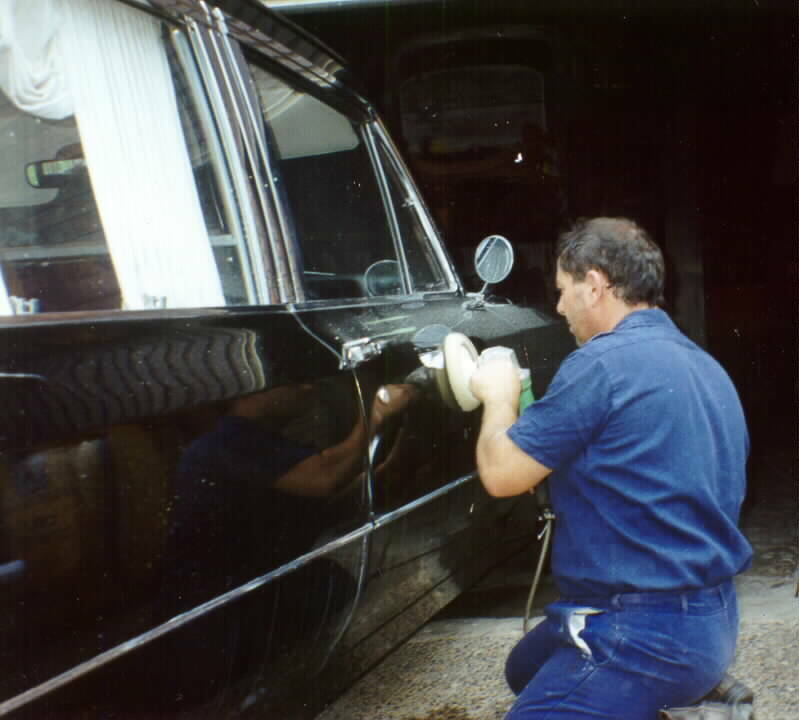 Also the vinyl trim has been carefully peeled back. 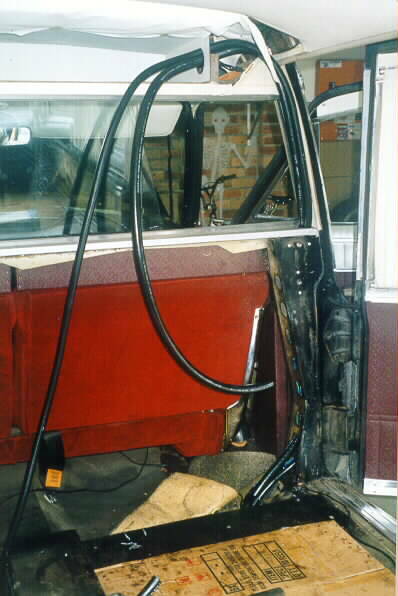 Installation of the rear air conditioning, with pipes run under the car and up the sides to where the evaporator was fitted. Thanks Roy! 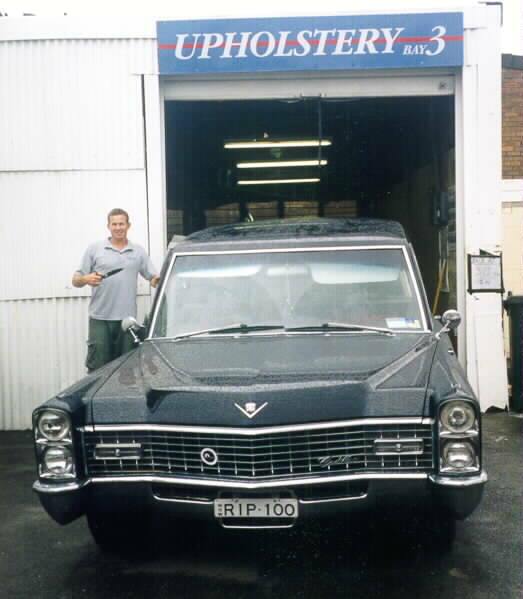 Adam gets to work on the carpeting and Elvira starts to look better already! The seats are ready. 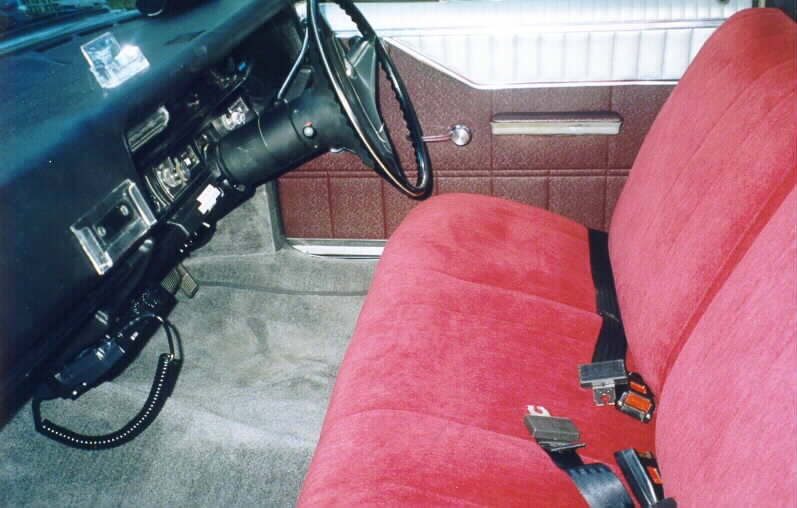 Shown here lying on their backs, and then installed. 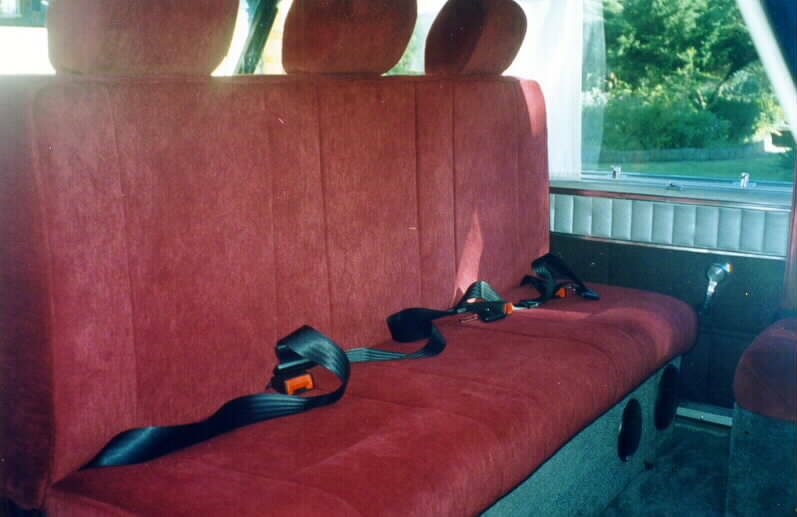 The rearward facing seats have headrests, together with a crashbar behind (by law). Note the spare wheel in the third photo. Original vinyl trim on doors and elsewhere has been retained. Meantime, Elvira undergoes some cosmetic surgery with Angelo. The worst rust was at the bottom of the front fenders. This was cut out and new steel welded in. Holes were drilled underneath to allow any trapped water to escape. 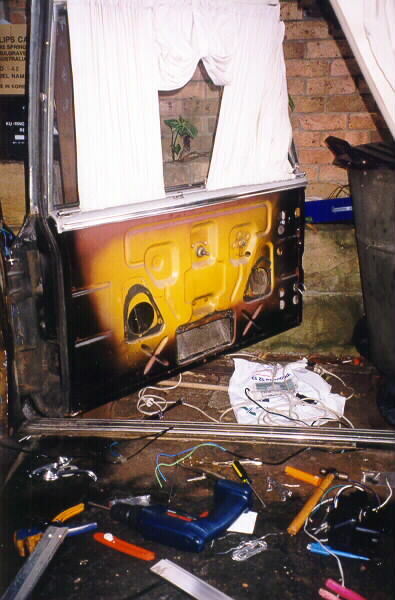 The roof, bonnet and tailgate were completely resprayed and other places repainted and blended in where necessary. Also, the rear side windows that used to leak water are now waterproof. The stainless trim at the sides that used to be screwed in, has been repaired and neatly fixed by clips. 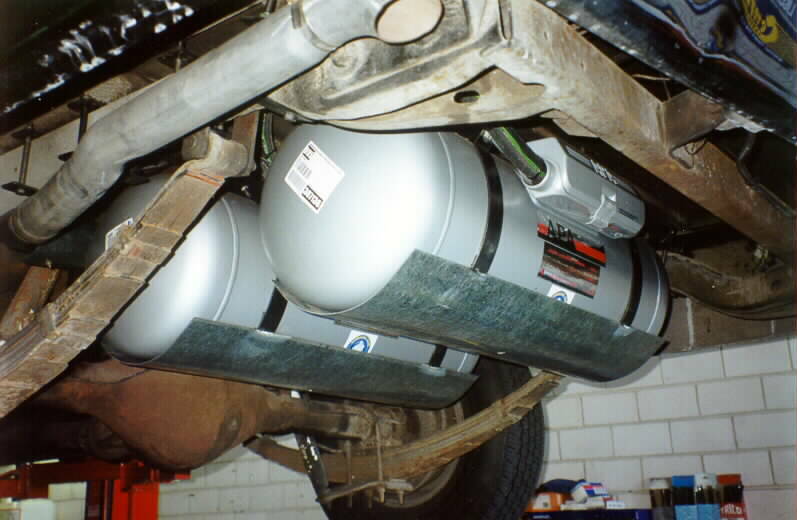 Conversion to LPG with two 68 (59 usable) litre LPG tanks installed underneath should cut running costs! Note the exhaust pipe had to be re-routed. After this photo was taken, the springs were reset and an extra leaf added. 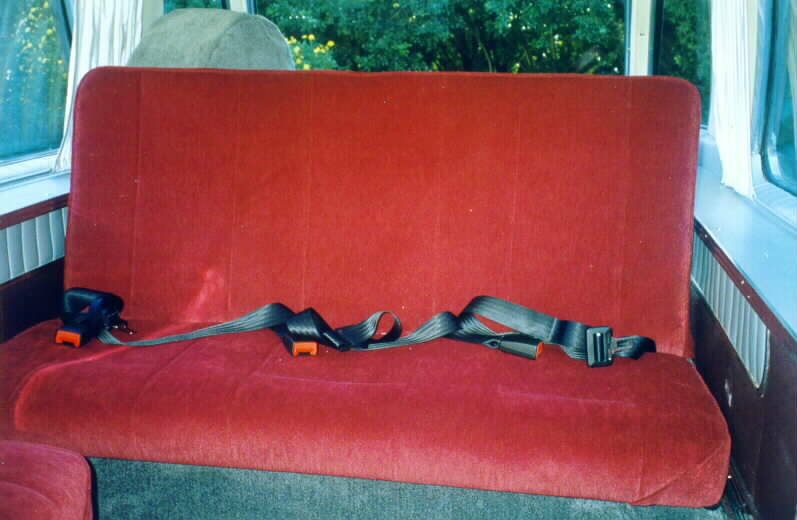 The front seat was recovered to match. 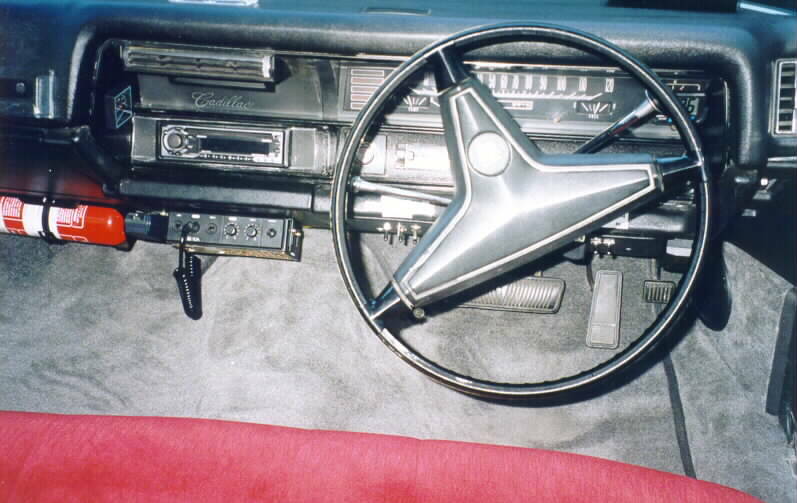 That's a PA system under the ashtray. Phil did all the auto electrical work. 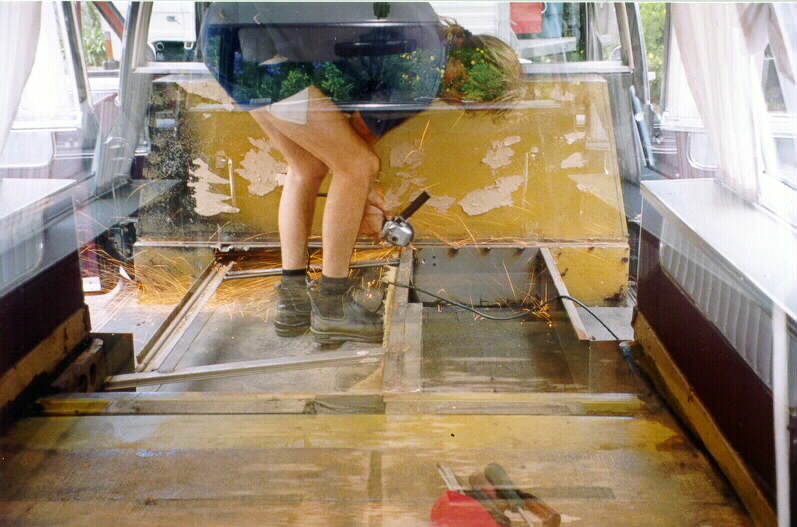 Here he is installing the green neon lighting underneath. Lucky he's not overweight! 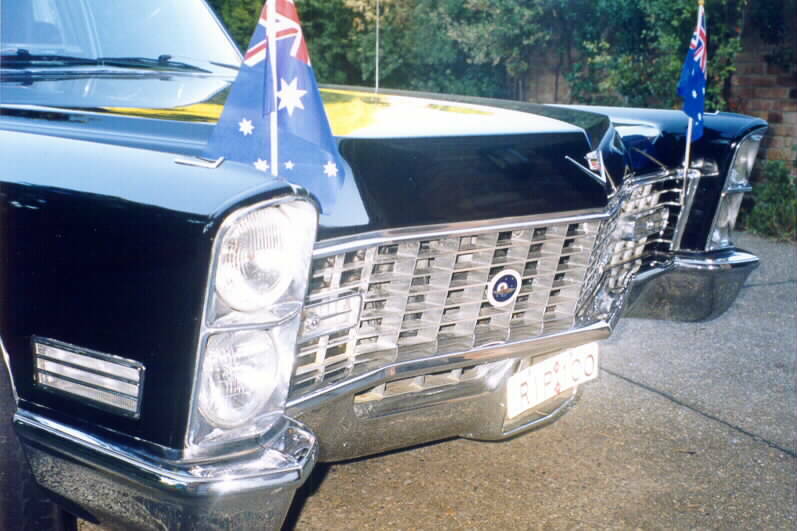 Check out my custom made flag holders! She's alive! Check out that red glow in the grille! Note too the new slimmer curtains for better visibility. The sign is a magnetic one. Lots of changes here. 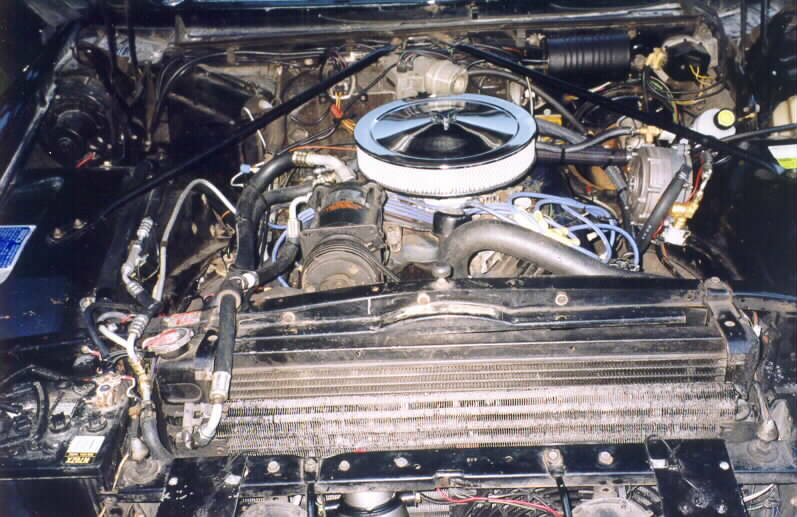 Most noticeable is the LPG conversion, and the extra air conditioning plumbing. There is also an extra battery in parallel with the existing, a bigger amperage alternator, a horn speaker and a turbo fan for the air con. 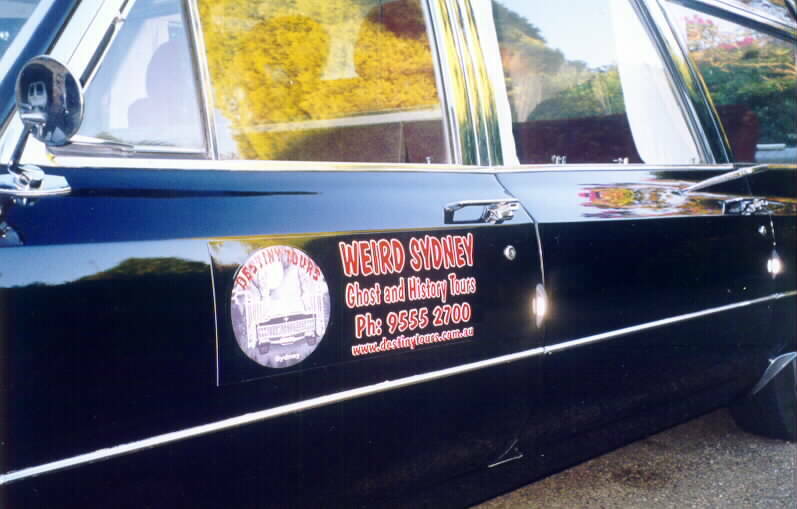 Every hearse to limo conversion needs a fridge and a cut down coffin for storage. 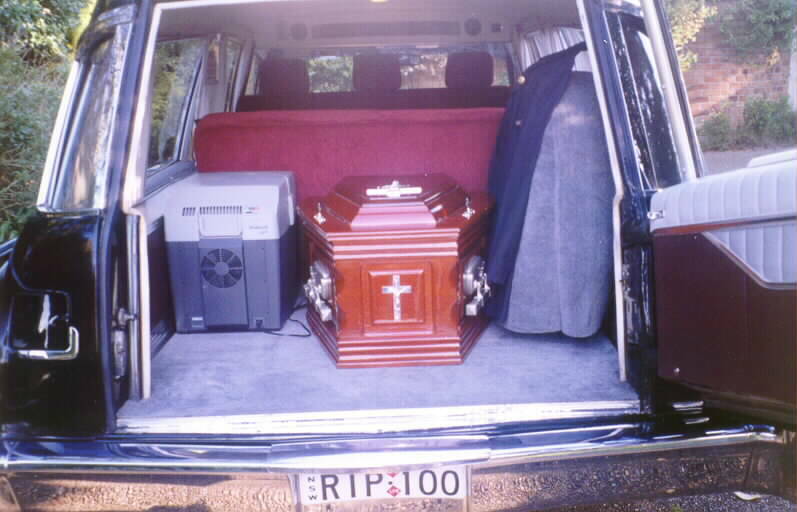 Note too the carpet covered spare wheel and a place to hang my jacket.